Only the best prams, strollers & accessories from all the best brands! One of the most important safety decisions you will make for your child is choosing the right car seat. When you’re out & about, make sure you're prepared for whatever comes your way! Designing your baby's nursery? From traditional to modern & contemporary, discover your nursery style now. From breastfeeding to toddler feeding, you'll find everything you need here! Keep warm, comfy, cosy & adorable from head to toe! Keep bath time healthy, safe & fun with great bath essentials! From baby monitors to baby gates, our selection of home safety equipment help give peace of mind. Make playtime fun & educational with gorgeous toys that encourages bubs creative side & stimulates the mind! Make life easier and more comfortable with everything you need during & post pregnancy! Our favourite selection of baby gifts, made with care and oh so cute! Want to add more to your registry list? (You know you do!) Checking in? Editing or inviting friends? Manage your registry easily, all in one place. The Baby Village Gift Registry takes the stress out of letting friends & family know what you want or need. Available in-store or online, we make the process as enjoyable & seamless as possible! It’s the go everywhere plastic nappy wallet that fits into mum's lifestyle and handbag! 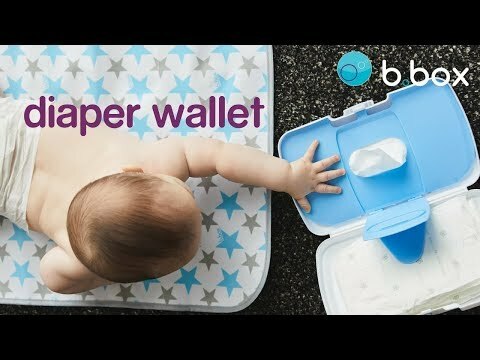 It comes with a funky, easy clean change mat and plenty of room for storage for two disposable nappies or even a spare change of clothes. Keep one in a handbag, nappy bag, car and pram, so mums will never be without the essential baby box. Unique dual access wipes hatches. Wipe clean change mat (48x43cm). Storage for nappies and disposable bags. Change mat made from coated polyester, polyester backing and trim. Flexible arm to keep everything in place. BPA, Phthalates and PVC free. Adding this item to your bag. Adding this item to your registry.